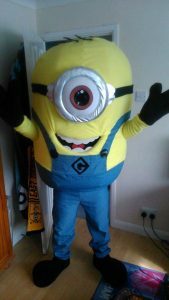 If you would like something extra special for your son or daughter’s birthday party, then why not hire one of our mascots to come and make their party one to remember. If they have a favourite character that they love at the moment, then can you imagine how thrilled they would be to have them at their birthday party? They will be the envy of all their friends. Your preferred mascot will meet and great your child’s guests, giving them the opportunity to have their photos taken with their favourite character. Whether they love Mickey Mouse, Olaf or a minion, we have a wide range of mascots to choose from. Our mascots will love to join in with the dancing and party games and will certainly make your child feel special. Our mascots can be hired by the hour, all day or with one of our bouncy castles packages. If you have a christening coming up then why not hire one of our mascots to keep all the children entertained. They are also ideal to have at weddings, one of our popular mascots can play with the children and keep them entertained maybe while the speeches are going on. This is one time you can guarantee that the children will want to run about and make loads of noise. Though we cannot guarantee our mascot can stop this from happening, they do like to run about and make a lot of noise too. If you have a fun day or a charity event coming up, then having one of the turtles or Minnie Mouse walking around will certainly make the children happy. Again, the children can make the most of photo opportunities with their favourite characters. They really will make you party or event, a memorable one.